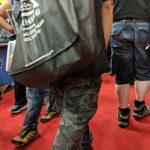 2018 was my second Gen Con ever. I like lots of Geeky things, but when it comes to games, I’m just a casual gamer. No, we aren’t going to talk about the six months in game time I lost to World of Warcraft in the mid-2000’s. Because of this, I learned that if I’m not casual, I’m a non-functioning human who spends all of their life in the game. Last year, I spent a lot of time in the vendor hall and because it was the fiftieth, I tried to see everything. This was, of course, impossible, but it gave me an idea of what I needed to see in the future. This year I had big plans, but then it happened. If you are a follower of the blog you know that Tony and I were hit by a car and at the time of the show, were still on the long road to recovery. So, this year we had no idea how to plan, since everything would depend on our energy and pain levels. We still enjoyed bits, but it was rough. We missed Thursday because I had a doctor’s appointment. It was the earliest appointment of the day, but it still ended with us getting downtown too late to find parking anywhere near the convention center. When you have to worry about a person with broken ribs pushing a person in a wheelchair with a broken leg, the comfortable walking distance shrinks considerably. Even if the first person didn’t have broken ribs, the only parking we did find was down an alley filled with potholes and loose grave, at the end of a large hill, which was not safe for the person in the wheelchair. On Friday, we got there really early, so we were able to find parking at the mall garage and made it to the press room to pick up our badges without too much trouble. We went to a panel and I played a long game while Tony visited the vendor hall and talked to friends. We had dinner with friends and were exhausted. Everything seemed to take three times more energy than it should have. This is especially a problem when you have to hunt for elevators. When we went to dinner (not naming the restaurant because this is the first time we have ever had a negative experience) there was an issue I’m still trying to figure out just how to respond to it. We were seated in a back room which is apparently used for storage as it had holes in the walls and a bunch of boxes stacked. Not to mention it had missed the last remodel and the decor didn’t match the rest of the restaurant. We were seated there “so it would be easier for me to get in and out with the wheelchair. It became obvious that is where they were putting all the people in wheelchairs and it was not for our comfort or convenience but for that of the other guests in the main part of the restaurant. On Saturday we got there early and we ventured into the vendor hall. I had read the article Tony shared written by Hans (Link) and thought I had prepared myself for the mass of people. I think I was in denial about just how rude people would be. There were lots of good people who were super sweet, and while not everyone was self-absorbed and possessed zero body awareness. I got tired of the view of butts and backpacks (see pictures). 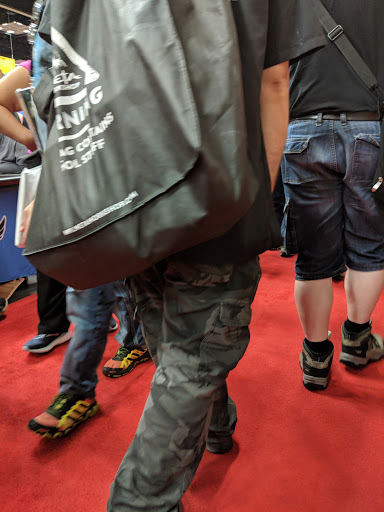 I got tired of not being able to see very far ahead of us when we were walking and not being able to look at all the merchandise. I could have locked the wheels and stood up, but with as difficult as it was getting people to make room for me in the wheelchair in the first place I was afraid to stand and have someone bump the wheel chair and knock me over or think I was just lazy and not really injured because I don’t have a cast or boot on my leg. We didn’t attend day four. Since it’s normally family day, by that point we would normally have done all we wanted in the first three days and used Sunday to recover so we can return to work. Instead we had a lazy morning and visited with a friend in Muncie. I was planning to talk about the games and the panels, but the physical challenges of the whole event have dominated my memory. I am still really irritated about the accessibility issues and my frustratingly slow healing process. 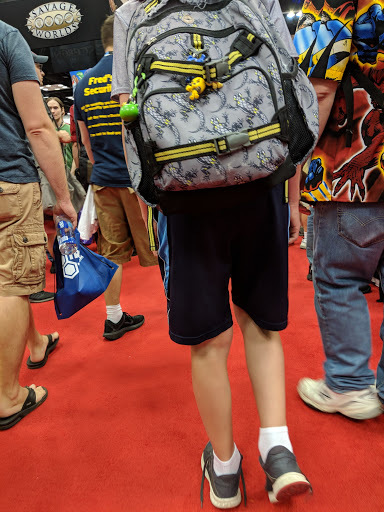 It is not lost on me that what I experienced as someone who is partially and temporarily impaired is nothing compared to what others experience not just at conventions, but everyday. *Since this was written my leg has healed very well. In case you were wondering. 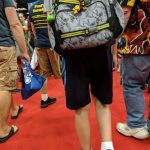 Note: Geeking in Indiana was able to attend Gen Con 2018 due to press passes provided by the convention. These gave us access to the convention, just like a standard 4-day pass, and access to the press room, but nothing else. All event tickets were purchased by the blog, and all opinions are our own.